“Great Karnak Inscription” 572-592, Merneptah Breasted, J. H. 1906 Ancient Records of Egypt. Vol. III. Chicago: University of Chicago Press. “Plague Prayers of Mursilis” A1-11, b, Mursilis Pritchard, J. B. 1969 Ancient Near Eastern Texts. Princeton: Princeton University Press. R.D. Barnett (1975). “The Sea Peoples”. In J. B. Bury, S. A. Cook, F. E. Adcock. The Cambridge Ancient History. II, part 2. Cambridge: Cambridge University Press. pp. 362-366. T. Bryce (1993). “Lukka Revisited”. Journal of Near Eastern Studies 51: 121-130. T. Bryce and J. Zahle (1986). 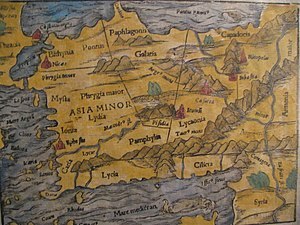 The Lycians. 1. Copenhagen: Museum Tusculanum Press. R. Drews (1995). The End of the Bronze Age: Changes in Warfare and the Catastrophe CA. 1200 B.C.. Princeton: Princeton University Press.